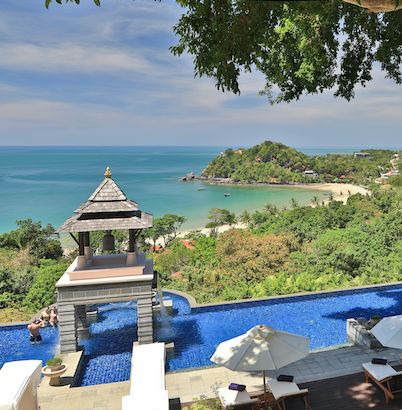 Overlooking the glorious Andaman sea, Pimalai’s beachside villas offer guests classy contemporary Thai style living space. Our Three Bedroom and Two Bedroom Beachside Villas come with their own private infinity-edged pool so guests are free to relax and rejuvenate in their own privacy. Our beachside villa One Bedroom (2 units) can be rented together with two units of one-bedroom Pavilion Suite to accommodate up to 12 people and can be an ideal private retreat for a group of families and friends travelling together. A living room, dining and kitchin facilities are also available to complete your ideal group vacation. - Living space 150 SQ.M. - The Living room should not be considered as a sleeping room. 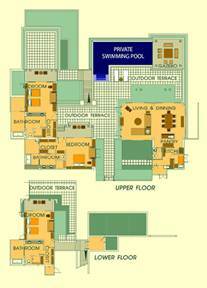 - Living space 350 SQ.M. 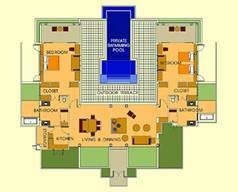 - 2 Large bathrooms, equipped with bathtub and shower. - The two bedrooms are not interconnected. - Living space 650 SQ.M. The Hillside Villas are situated some 60 to 80 meters above sea level. These villas have a steep drop-off from the terrace and the infinity pool so parents with young children who wish to book these villas should be especially vigilant in safeguarding their young ones from potential dangers. The Beachside Villas also have an infinity-edge swimming pool with a 4 to 5 meters drop off at the end. The pool for the Hillside and Beachside Villas is NOT fenced. Please also take note that none of the bedrooms in the Hillside or Beachside Villas are inter-connected.